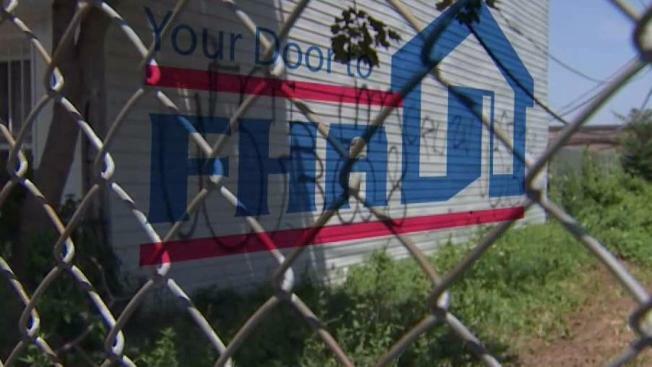 The I-Team discovered that New York's pension funds are investing in a company that's forcing people out of their homes. Chris Glorioso reports. Despite a pressing need for more affordable housing in New York, the state's public retirement funds have invested more than $1 billion in Lone Star, a private equity company accused of predatory lending and unnecessary foreclosures, an I-Team investigation has found. According to a lawsuit filed by several homeowners in southeast Brooklyn and Queens, Lone Star has purchased large portfolios of distressed mortgages insured by the Federal Housing Administration. But instead of considering typical FHA modifications -- like interest-rate reductions or loan balance reductions -- Lone Star is accused of offering mostly loans with interest-only periods and balloon payments. Karen Morrison, a retired NYPD officer, says Lone Star offered her father one of the interest-only modifications when he fell behind on his mortgage payments two years ago. Now she says she's afraid he won't be able to afford the balloon payment when the interest-only period is up. "It's like four generations that live in the household and if we cannot afford to pay when the interest-only payment is up, we're all going to be out on the street," said Morrison. On top of the stress of potentially losing her family home, Karen Morrison said it was “like a shocker” to hear her own retirement fund, the New York City Police Pension Fund, has invested more than $100 million in Lone Star, the very company that may one day foreclose on her father's house. “It’s almost like I co-signed it,” she said. After the I-Team contacted NYC Comptroller Scott Stringer to ask about the Lone Star investments, Stringer wrote a letter to Lone Star Chairman John Grayken, expressing concern about the interest-only loan modifications. “This kind of predatory lending is unacceptable,” Stringer told the I-Team. "When a company acts more like a predator, rather than an investor, we have serious questions of that company and we are now in the process of hunting down those answers." Public Advocate Letitia James is another city official who has expressed concern about city retirees investing in Lone Star. Last year, as a Trustee on the Board of the New York City Employees Retirement System, James successfully opposed an opportunity to make further investments in Lone Star. She said it is ironic that a cop or sanitation worker could face foreclosure at the hands of the very company financed by their own retirement savings. “Basically, municipal workers in the city of New York – we’re taking their money and using it against them and foreclosing on their property,” James said. Court records show Lone Star private equity funds have foreclosed on just over 600 New York homes since 2008. But Lone Star says foreclosure is always a last resort and – far from being predatory, the company’s modifications actually help troubled homeowners. Christina Pretto, a spokeswoman for Lone Star and its loan servicing arm Caliber, sent the I-Team an email insisting the company has actually kept thousands of U.S. families in their homes by modifying 30,000 distressed mortgages in the last 18 months. “These modifications occur despite the fact that over 80 percent of the loans purchased by Lone Star and transferred to Caliber are in default, with an average payment delinquency of nearly 2.5 years,” Pretto said. Lone Star declined to say how many of its modifications are the interest-only variety. Though FHA mortgages don't guarantee loan modifications, they do require lenders consider interest-rate reductinos, loan balance reductions or extension of loan terms if borrowers hit hard times. Because Lone Star purchased distressed FHA loans second hand, it is unclear if the private equity firm was required to consider the same kinds of standard modifications. Christopher Fasano, who represents the homeowners suing Lone Star, said those interest-only deals are likely to drive scores of homeowners into unnecessary foreclosure in the next few years. Fasano’s lawsuit says the sale of troubled mortgages to one Lone Star Fund in particular -– LSF9 –- has had a disproportionate impact on neighborhoods of color. According to a 2016 annual report, the New York State Teachers Retirement System has $48 million invested in LSF9 and another $98 million invested in other Lone Star funds. Representatives from NYSTRS did not immediately return the I-Team’s request for comment. According to the Stringer's office, the city’s five public pension funds have a total of about $990 million invested in Lone Star funds. That makes up less than half a percent of the city’s $180 billion dollar retirement portfolio. None of the five funds have investments in LSF9. The New York State and Local Retirement System, managed by New York State Comptroller Thomas DiNapoli, also has no investments in LSF9, though the pension fund does have $40 million invested in other Lone Star funds. DiNapoli declined to speak about Lone Star’s mortgage business, but Matthew Sweeney, a spokesman for DiNapoli, said he is aware of the accusations of predatory lending. “Certainly Lone Star’s track record will be subject to scrutiny if it presents itself for investments in the future,” Sweeney wrote. Both comptrollers, Stringer and DiNapoli, have been outspoken advocates for more affordable housing in New York. Both men have directed portions of their pension investments to go toward efforts to develop and build more affordable housing. Anthony Mohen, the attorney who represents Morrison’s family, said it makes little sense for a pension to invest in affordable housing and at the same time invest in a company behind interest-only modifications. “Why would they want their same pension fund also being the one that’s investing in a firm that’s turning around and forcing people out of their homes?” Mohen said.